94 by 66 by 8 1/2 in. 238.8 by 167.6 by 21.6 cm. 61 by 67 by 7 7/8 in. 154.9 by 170.2 by 20 cm. 42 1/2 by 42 1/2 in. 108 by 108 cm. 48 1/4 by 48 1/4 by 4 7/8 in. 122.6 by 122.6 by 12.4 cm. 52 1/2 by 66 1/4 by 2 1/4 in. 133.4 by 168.3 by 5.7 cm. Mitchell-Innes & Nash is pleased to present Chris Johanson: Windows, the gallery’s first exhibition of the West Coast artist, on view in the Chelsea space from September 13 through October 20. The exhibition represents a new direction for Johanson, who has long been engaged with the meditative qualities of art-making, and sincere, direct communication through painting. His new paintings on found wood are self-contained compositions, or ‘meditations on being,’ and several will incorporate painting directly on the gallery walls in a play on windows and transparency. The artist approaches these paintings as windows onto the world, windows to the past or future, or portals for introspection: looking out, and looking in. This will be Johanson's first solo New York show since 2008's Totalities at Deitch Projects. Johanson’s work has blended a simple, unschooled style with an exuberant sense of color and a playful but sharply critical edge. While his early work tended toward naïve figuration, his recent work has shifted markedly toward abstraction. The artist sees these two modes of working as inter-connected and engaged with the same ideas: an exploration of painting as an artifact of how life is lived; and the notion of art as a nexus at which nature, culture, and self come together. 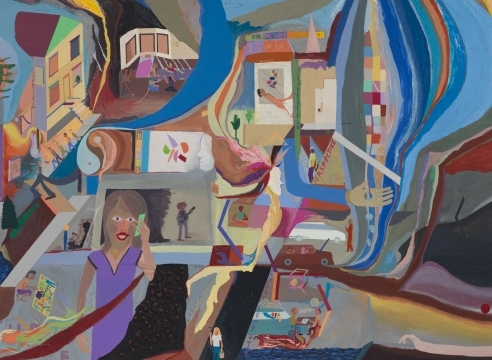 Johanson’s abstractions have a poetic, affective quality, communicating moods or states of mind through his saturated palette. Whether abstract or figurative, his work expresses the artist's strong beliefs in environmentalism, compassion, and peaceful co-existence. Chris Johanson was born in San Jose, California in 1968. He was part of a community of artists formed in San Francisco’s Mission District in the late 1990s, and gained widespread attention for his participation in the 2002 Whitney Biennial. Johanson has exhibited widely in museums and galleries internationally over the past decade. He has had solo exhibitions at museums including the Malmö Konsthall, 2011; Portland Art Museum, 2007; San Francisco Museum of Modern Art, 2003; and the UCLA Hammer Museum, 2001. His notable group exhibitions include Dialogue of Hands, Glasgow International 2012; A New York Minute, Depart Foundation, Rome, Italy; the 2006 Berlin Biennale, Germany; the 2005 Istanbul Biennial, Turkey; Monuments for the USA, CCA Wattis Institute, San Francisco; Beautiful Losers: Contemporary At and Street Culture, Contemporary Arts Center, Cincinnati and Orange County Museum of Art, Newport Beach, CA. As the story goes, about 12,000 years ago human beings migrated to the West Coast of North America. They came from Siberia by way of the Bering land bridge and brought with them a system of spiritual beliefs based in rituals of astral projection, animal metamorphosis, and the healing séance.